Ghost Branch can be advanced. 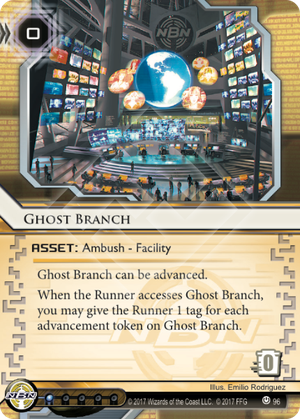 When the Runner accesses Ghost Branch, you may give the Runner 1 tag for each advancement token on Ghost Branch. Ghost Branch may be one of the least used Ambush in the game. Let's see if we can change that. Yet even those qualities are not enough to justify its drawback. The reason why Ghost Branch is not that used is simple. Where Project Junebug threatens to kill the runner and Aggressive Secretary is extremely likely to open a scoring window, Ghost Branch is more subtle in its use and need some form of tag punishment to be effective. economic war (by flushing the runner's credit pool with Closed Accounts or hiring a Freelancer to kill his friends). 'passive taxes', like ICE activated only if the runner is tagged (Information Overload, Universal Connectivity Fee, etc.). You may want to play Ghost Branch in a tag heavy deck or in a kill deck as a one-of, to surprise the runner ("You're playing this? What does it do again?"). Still, there are better ways to use Ghost Branch, that can result in a win-win situation for the corp. This requires the combination of Ghost Branch with two other cards: Trick of Light and Mushin No Shin. With both cards, Ghost Branch is a token repository for Fast Advancement if the runner does not run it, and can be triggered with a low economy if the runner is daring. The fact that Mushin No Shin does not cost any creds means that you can Fast-Ad an agenda for 2 creds (1 for trick of light and 1 for a classic advancement). This should be compared with the 6 creds it takes to rez a SanSan City Grid and the 4 creds it takes to use Biotic Labor (respectively 8 creds and 7 creds to score a 3-for-2 agenda). This means that you can easily recover from Account Siphon, or that you can simply play with very few credits in your pool, and still threaten to score. With Near-Earth Hub: Broadcast Center, opening a server with Mushin No Shin makes you draw a card. Besides, importing 3 Tricks and 3 Mushin No Shin costs 15 influence points, leaving you 2 precious points to strenghten you ICE mix. Also, fast-advancing an AstroScript Pilot Program is usually synonymous with victory. With Jinteki: Replicating Perfection, you can ensure that the runner will remain tagged during a full turn if he accesses a Ghost Branch with 3 counters. It does take two click to access an RP remote, after all. A package of 3xGhost Branch and 2xClosed Accounts cost a mere 5 influence points, which leaves a lot of breathing room for the rest of the deck. Using Tricks of Light with Ghost Branch (and Ambushes in general) is an all-in strategy, simply because it takes a lot of deck space to have all the pieces you need. Fortunately, you do not need all the pieces at once: you can Mushin No Shin your Ambush anytime, and then wait for an agenda or a Trick of light.